Having lived a storied if not glamorous life serving his country in both uniform and business suit George H.W. Bush peacefully exited a world he helped reshape during his lone yet very consequential term as president. The word most associated with the late president is decency and an argument can be made that he was the last truly presidential American chief executive. Bush was the first vice-president to be directly promoted to the top office since Martin van Buren in 1836. With a resume that included tours in Congress, the United Nations, Beijing as an envoy, the CIA, and eight-year presidential understudy during the Reagan Administration Bush was the most prepared to ascend to the presidency since John Quincy Adams (sorry Hillary!). Bush’s greatest failing was his insufficiency as a partisan politician, an ironic criticism for a man who steered the RNC during the turbulent Watergate Era. However it was that altruistic side and naivete of the Beltway landscape that doomed him to becoming a one-term president, unable to recognize the duplicitous nature of his Democratic adversaries and the intense partisan nature of the press. You would’ve thought the unforgivable Wimp cover story by Newsweek would’ve seared that into the man’s psyche, though 41 proved to be forever forgiving of an institution that unfairly maligned him with regularity. Bush saw problems not in red or blue hues but what was in the best interest of the country. His reneging on his now infamous “Read My Lips: No New Taxes” pledge signaled his willingness to inflict great political harm to himself to achieve a noble goal. It was simultaneously a politically suicidal and selfless act. Regrettably the other side of the aisle saw it as a sucker move that gave them a shot at toppling an insurmountable incumbent in the 1992 election. Disappointed in the results, Bush was not bitter in defeat, later forming a bond and friendship with the man who evicted him from the White House. Together Bush and Bill Clinton raised millions of dollars to aid tsunami victims in Indonesia and the cause of rebuilding communities across the Gulf Coast after Hurricane Katrina. Bush didn’t retreat from the world but found ways to serve the country sans office. Perhaps in an attempt to exorcise the “out of touch” smear from the 1992 campaign, Bush maintained an active and high profile social calendar. Poppy assumed the mantle of America’s grandpa. Bush the Naval pilot was a profile in courage; Bush the politician was a profile in character. His successors failed to follow his example, including his son, allowing their idiosyncrasies to define them individually and their respective presidencies. Post-41 politics wasn’t about solving problems but winning and losing and advancing one-sided agendas. With rare exception, sincere coalition building died in the aftermath of the tax deal. Dealing in good faith with the other party died on Capitol Hill with Bush’s reelection chances.. When Bush took off from the White House south lawn aboard Marine One for the final time in 1993 the presidential helicopter took from Washington not only the First Family but the old way of congenial politics and the class that Americans up until Generation X associated with the presidency. 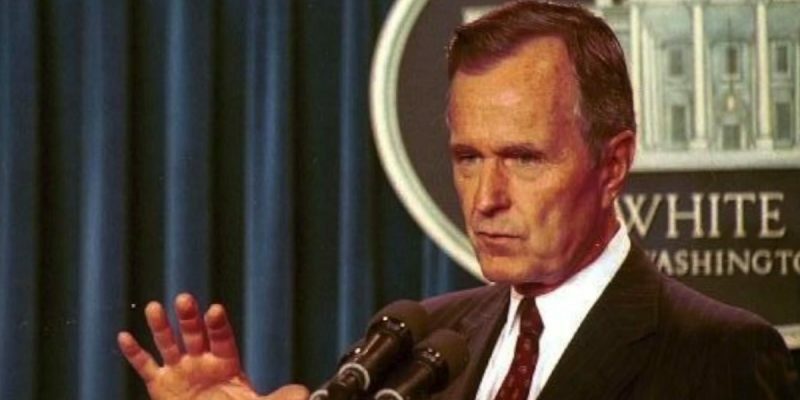 George Herbert Walker Bush was a revered political figure, even to those who disagreed with his politics and opposed his candidacy could respect. And sadly his internment on the site of his presidential library at College Station will mark the burial of the last president who commanded broad respect and admiration from across the political divide.